Well the arctic blast has moved in to Colorado and I’ve been freezing my buns off all week. Our heater has been working overtime, the fireplace is on most of the day, and thanks to roasting this Twice Baked Butternut Squash the oven has been heating the house as well! The temperatures took a major nose dive on Monday. It started with a huge windstorm that eventually turned into snow later in the day. The nights have been getting bitterly cold, Wednesday night it was -6 degrees! I’ve been running on my treadmill the past few morning instead of outside because of all the ice and while I’m so grateful I have a treadmill it is so BORING! I can handle 5-6 miles on my treadmill as long as I have some cooking shows or movies recorded, but it starts to get ridiculous and mind numbing when I’m running 11-12 miles on it. I won’t complain too much though because it sure beats running in negative degree temperatures and risking falling on my face in the ice. So, like I was saying above, on top of the heat and fireplace keeping the house warm, I’ve also had the oven on quite a bit. When you’re stuck inside it turns into an ideal time to bake, roast, and test out all the delicious Thanksgiving side dishes and desserts. 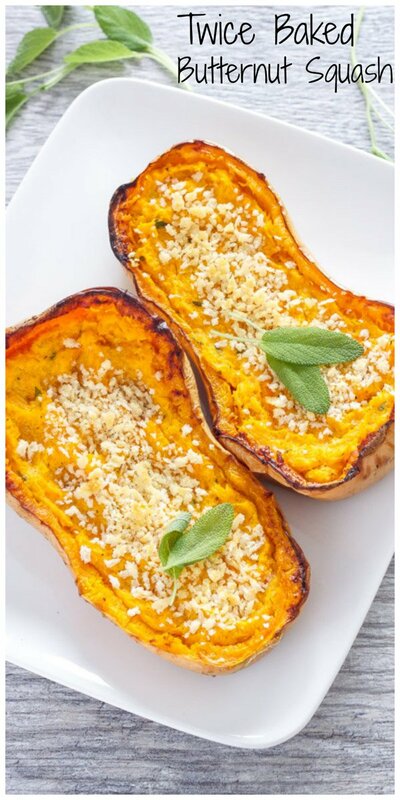 Today I’m sharing this great recipe for Twice Baked Butternut Squash. Of course there are always mashed potatoes and sweet potatoes on the Thanksgiving table, but I adore butternut squash and wanted it to have a place on the table as well. 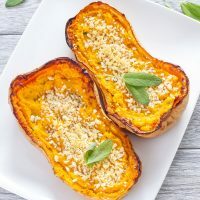 I’m sure most of you have roasted or baked butternut squash before and are well aware of how delicious it tastes this way, but have you have ever baked it twice? 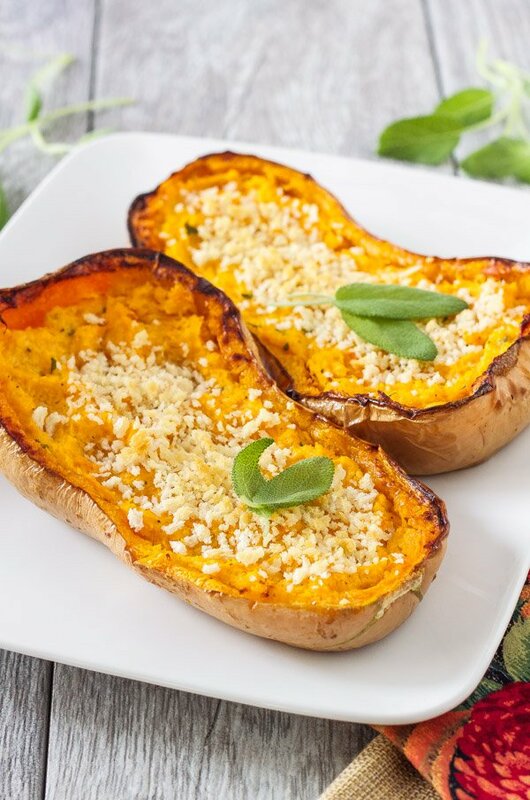 Twice Baked Butternut Squash is the same concept as twice baked potatoes. You roast the squash, scoop out the filling, mash it up and add a bunch of good stuff to it, then put it back in it’s shell and bake it again. Sure it’s a little more work, but it tastes amazing and the presentation is lovely! Let’s talk about what I mixed into the filling. To the mashed up squash I added goat cheese, Greek yogurt, sage, salt, and pepper. The tang of the goat cheese and Greek yogurt, mixed with the sweetness of the squash and the classic Thanksgiving flavor of sage, was a perfect combination. The flavors were both familiar thanks to the sage and unexpected with the addition of the goat cheese. Once the filling was all combined, I put it back into the shell of the butternut squash and topped them with panko breadcrumbs and a drizzle of olive oil for a nice crunchy topping. 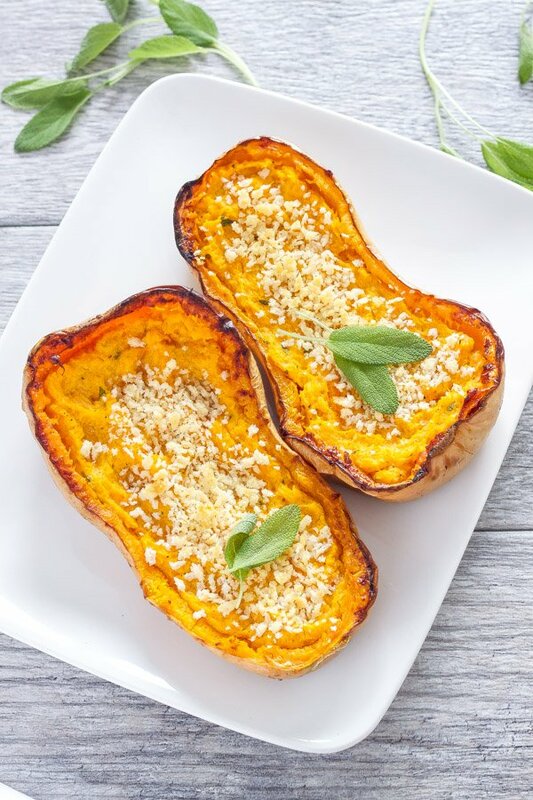 If you are looking for a new addition to add to your Thanksgiving table this year, and one that isn’t the traditional side dish, give this Twice Baked Butternut Squash a try! Twice Baked Butternut Squash is the perfect fall side dish! Super creamy and full of flavor thanks to goat cheese and sage! Place the halved butternut squash cut side down on the baking sheet and cover completely with another piece of foil. Bake the squash for 40-50 minutes or until until a fork inserted into the flesh comes out easily. Remove the squash from the oven, lower the temperature to 425 degrees, and let the squash cool slightly. Using a spoon, scoop the flesh out and leave a 1/4 inch border around the squash halves so they will hold their shape. Discard one of the squash skins so that you have a total of 3. In a large bowl mash together the squash flesh, salt, pepper, sage, Greek yogurt, and goat cheese. Once everything is combined, spoon the squash mixture back into the 3 skins. Top the squash with the panko and drizzle with olive oil. 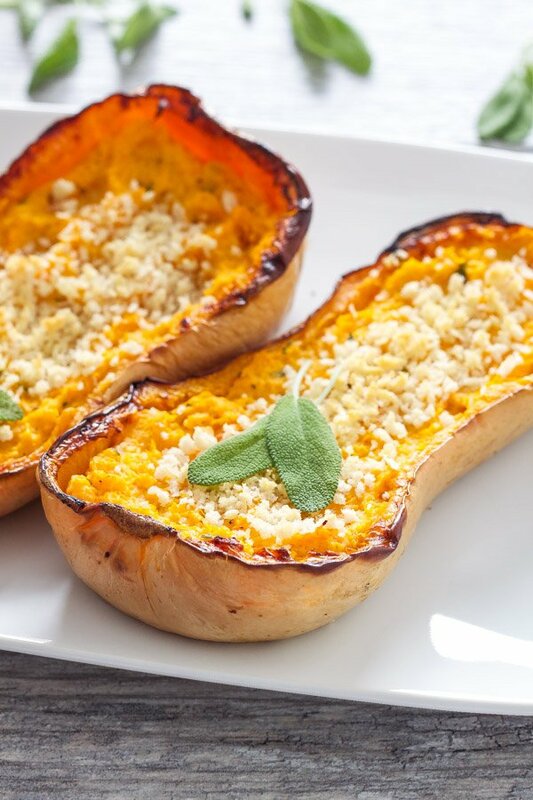 Place the squash back in the oven and bake for another 10-15 minutes or until the mixture is heated through. The size of the butternut squash used will effect the time that it needs to roast. Start checking the squash at 30 minutes and note that it could take up to an hour depending on the squash size and your oven. 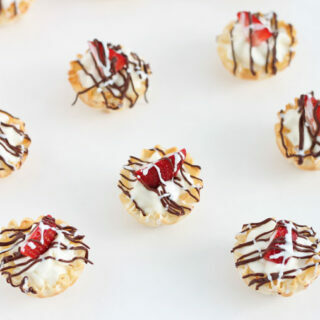 My favorite recipe of the day, absolutely love this! And you just made my day Matt! Thanks so much and have a great weekend! Danae, this is one of the best ideas! I make butternut squash all the time, but have never thought to twice bake it. Pinned! This looks fantastic! I'm definitely making for a party this weekend! Hi Felicia! As long as there is a link back to the original post I'm fine with it. Thanks for asking! I was really excited about this recipe, and unfortunately, I was equally as disappointed with the actual results. After 35 minutes in the oven at 450, covered with foil as recommended, the squash halves were still basically raw. I popped them all back in for another 15 to 20 minutes, and the smallest of the halves was still very difficult to scoop out with a metal spoon. I took the foil off and switched my oven to convention, afraid of turning the heat up, and this still didn't cook the squash enough to scoop out the contents, especially in a way that left the outer shell intact... After much frustration and the careful use of a knife, I ended up throwing all of the edible contents into a bowl with the other ingredients and blending everything together with a hand mixer. I scooped the mixture into a Pyrex dish, sprinkled the Panko on top, and let it all brown for about 10 minutes. My sweet family liked the flavor, but we all agreed that the texture was a little unpleasant given that some larger chunks of squash were still under-cooked. All in all, I give you props for such a lovely presentation... But for anyone who realistically wants to duplicate it, cook the squash for AT LEAST an hour... or prepare to have your expectations squashed. Hi Ashley. I'm sorry you had so much trouble with the squash. 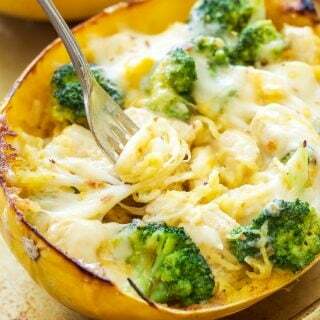 The size of the squash you use can greatly vary the cooking time, I'll be sure to go back and add a note to the recipe so that others are aware. Thank you for bringing this to my attention. So so good!! I've made it so many times and I love it more every time! Do you need to throw one of the halves away? What purpose does that fulfill? If I wanted to make all four halves will that still work with this recipe? I'm planning on making this for Thanksgiving. Hi Olivia, Sorry if I wasn't clear in the recipe. I use the flesh from all of the squash, but discard one of the shell halves. I do this so that each shell has more filling in it. It's mostly for looks so if that's not important to you feel free to use all 4 shells. Enjoy the squash and have a great Thanksgiving! How far ahead could someone make this? I assume cooking the squash ahead is fine, but wasn't sure about all the other ingredients. Hi Crystal, You could probably get the filling all prepped 1-2 days in advance. 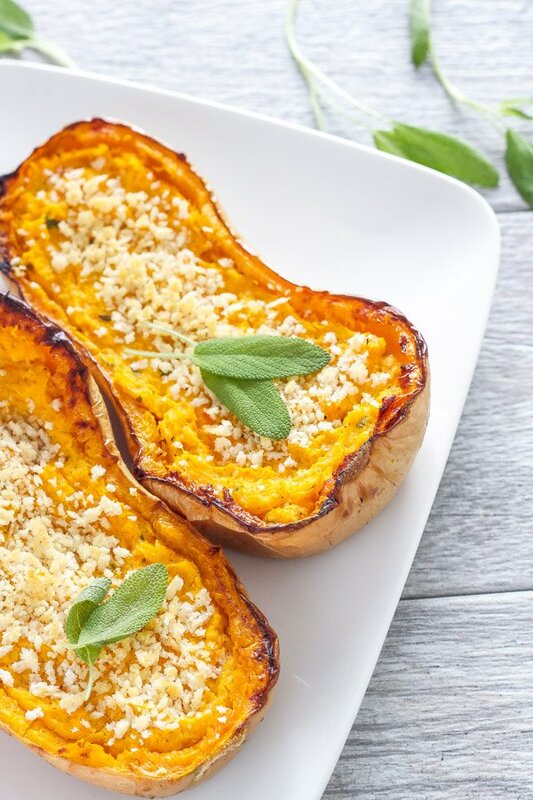 The butternut squash shells may not hold up if you choose to make it in advance, but you could always bake the filling in a casserole or baking dish. I would also wait to put the panko on top just before baking or it won't be crisp. Hi There! 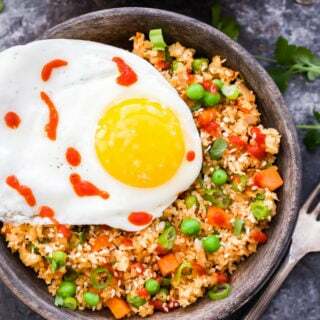 Our family is vegan, and I would love to use this recipe. What recommendations would you have as a swap for the greek yogurt? Thanks so much! Hi Adrienne! I haven't tried making this recipe vegan, but if I did I would use canned coconut milk in place of the Greek yogurt and goat cheese. Start with 1/4 cup and go from there until you get the consistency you like. Hope it works out for you!